This is going be an organic, living, breathing web page. Having recovered from complete ACL, MCL and LCL tears to the point where I can run again, it’s almost time to start skiing again and the question is which Donjoy ACL brace to use. 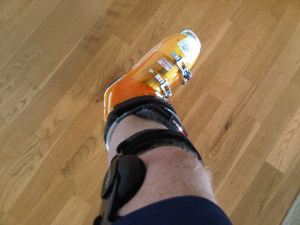 The plan is to discuss my choice of brace and then to review it as I take to the slopes again this winter. It is now 7 months post ACL surgery. You’ll have seen from the rest of the site that I relied heavily on the DonJoy TROM Adjuster brace during rehab and so the manufacturer of my ski brace is an easy choice. However, if you visit the DonJoy site I’m sure you will find the same issue that I did – a plethora of choice with nothing to provide the reader with a quick overview of which brace to use under which circumstance. The following is probably an over simplification but it provides an easy way into the myriad of knee ligament braces available. The Playmaker range is for mild MCL/LCL strains only. The Defiance and Defiance III are heavy duty braces for ACL/PCL injuries but are custom made. You probably would only use one of these if prescribed through your Physical Therapist. That leaves 3 DonJoy ACL brace types that you can buy online via one of the brace shops and that are available in different sizes but are not customer made. In descending strength order they are the Armor, the Legend and the 4TITUDE. All 3 are for ACL, PCL and combined ACL/PCL injuries. However, the 4TITUDE is for non-contact activities only and the Legend was designed for water sports. It is the Armor that offers the strongest support for contact and extreme sports. The excellent news is that the Armor is now available with a shortened fit below the knee to allow for a ski boot. Having worked through the myriad of options on a number of different websites, I have identified the brace that I need to buy – the DonJoy Ski Armor. The next challenge was to find the right size. The Brace Shop offers help with sizing in terms of where to measure your calf, knee and thigh to select the correct brace. Unfortunately, my calf and knee sat in the “Large” section but my thigh measurement fitted in “Medium”. At first I thought my thigh was still suffering from atrophy but when I measured the other thigh, I found the same thing. My legs are my best feature after years of sports so I’m not sure who the sizes are aimed at? I used live chat on the website to ask one of their technical support people which size I should select and was told to buy for the knee fitting which I guess is pretty obvious. However, what to do about the ill-fitting thigh? The agent on live chat said that it was OK to manipulate the thigh piece by which she meant to squash it into shape! As of today, I have ordered the brace and am waiting for delivery. I’m not sure about spending $499 on a brace and then immediately deforming it to fit my thigh. Oh well, let’s see and watch out for the next installment when I will report back on making it fit and then the final installment on this page when I take the brace (and the rest of me) to the top of a mountain and head downwards on two slippery bits of wood. Until then! Then is now! Well, at least the DonJoy Ski Armor has turned up. The snow has too in Colorado but I’m still going to give it another 4 weeks before I head to the top of that hill. You can see my knee brace below. It’s lightweight and it looks sturdy enough. The first disappointment was realizing that the instructions provided with the brace were generic to all the Legend, Armor and 4TITUDE braces. The main instruction booklet was also in several languages which meant that the print was very small and the diagrams (for fitting) almost illegible. This is a serious support mechanism that I hope will prevent me from tearing my ACL again – a dedicated instructional piece with legible print and diagrams would be a lot more encouraging. There are lots of extra pieces (pads, straps, some metal bolts) in the packaging that are not referenced at all and one of the instructions begins “if your brace has a supra condylar pad (with a ridge).” Well excuse me, you sent me the brace, don’t you know if it has whatever one of those is? 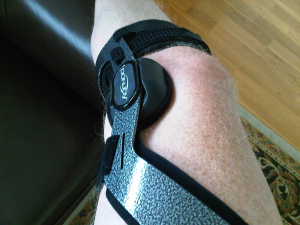 I managed to get the knee brace on very easily and it is actually very comfortable. I’m not 100% sure of the exact positioning which is another concern but at least it fits with the ski boot. All in all I’m left with the feeling that DonJoy ACL braces are best if prescribed and fitted by your physical therapist. If you still have that option then that would be my recommendation. I was hoping to get to ski and try out my DonJoy Ski Armor way before now. However, the conditions have not been great in Colorado so far this winter and today was the first opportunity I had. I skied at Eldora which is about 25 miles from home. The brace fits very snugly and really does feel as if it is protecting the knee and its low profile made it unnoticeable underneath my ski pants. It gave me quite a mental crutch as I headed up for the first run of the day. Although it was a little icy owing to the lack of snow, there was some powder down the sides of the groomed runs and I was able to carve some nervous turns in the slightly deeper snow. My knee felt good and the brace was effectively invisible, I really didn’t know I was wearing it. The other great thing was the brace didn’t move. I had wondered if I would be endlessly fiddling with it and trying to hold it in position but I put it on at home before leaving and it didn’t move until I took it off several hours (and ski runs later). Mission accomplished. I didn’t push it today but I have total confidence that, when the deep snow comes and those moguls form, I’ll be carving nicely with the DonJoy Ski Armor protecting my ACL.